Native Instruments Maschine Mikro MK2 Groove Production USB Controller White DJParts - All Variety of Parts that DJ Needs. MASCHINE MIKRO from Native Instruments is the perfect entry into the world of MASCHINE, giving you tactile, hands-on control for beat production, sampling and performance. This latest version of the MASCHINE MIKRO has plenty to boast about, now with improved sensitivity, each one of the touch-sensitive pads can be assigned a separate color to easily identify different sounds, patterns, groups and scenes. Speeding up workflow and helping organize kits and projects. Additional improvements include the ability to timestretch and pitch-shift samples directly from the hardware, eliminating any need to jump back and forth from host systems. MASCHINE MIKRO also allows for Host Transport Control, so the hardware’s transport controls can be used to control the host DAW when the unit is being used as a VST, Audio Unit or RTAS plug-in, which means more time on the hardware and less time jumping back to your computer to work. Also, MASCHINE MIKRO now has the same Auto-Write function as its big brother, so you can easily record parameter automation right from the hardware. As if those weren’t enough upgrades, there are some new effects such as Transient Master, Tape and Tube Saturators that will help further sculpt performances, and a full version of the MASSIVE synthesizer is included with 1,300 earth-shattering sounds to play with. MASCHINE MIKRO is a professional music production tool, combining the flexibility of software with the immediacy of hardware. Create rhythms, bass lines, chords and melodies, and build tracks on the fly with the intuitive, clip-based sequencer. The New MASCHINE MIKRO also gives you a high-performance sampler, professional effects and full support for VST and Audio Units plug-ins. What’s more; you can also run MASCHINE MIKRO as a plug-in in your DAW. More than 6 GB of production-ready samples, patterns, and effects for all styles, with drums and basses plus dynamic synth and instrument sounds, many created by renowned artists and producers, and a range of dynamic studio-quality effects are included. 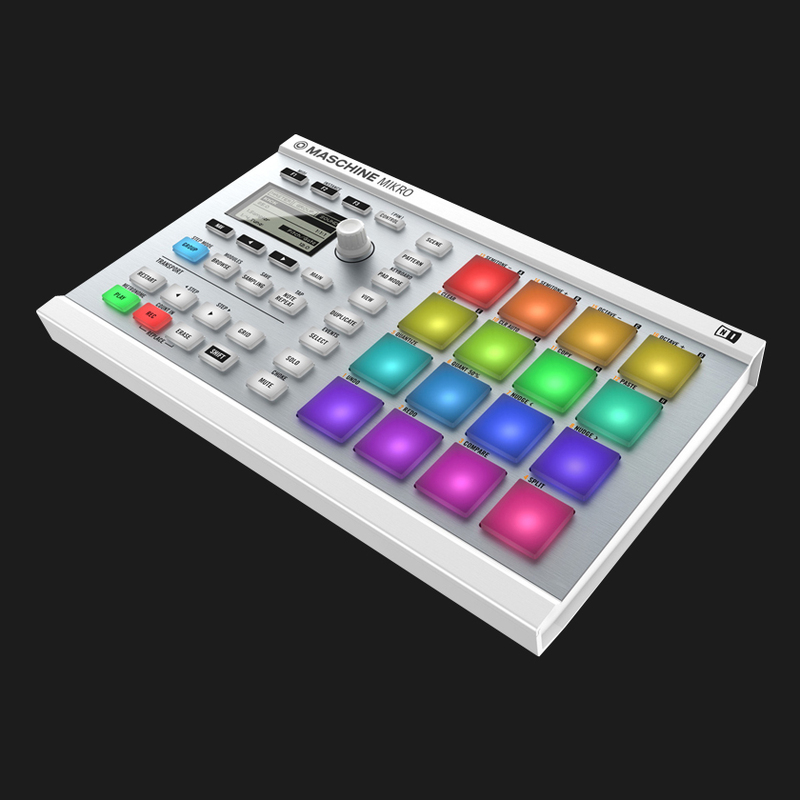 Select sounds using The New MASCHINE MIKRO’s super-simple browser and start playing immediately. And if you need even more, get an extra boost for your library with MASCHINE EXPANSION packs. MASCHINE MIKRO gives you direct access to your favorite Native Instruments or 3rd party VST or Audio Units plug-ins, to further expand your instrument and effect arsenal. Start your collection with the free copy of KOMPLETE ELEMENTS, with over 1,000 stunning sounds, all seamlessly integrated and easy to browse in MASCHINE MIKRO. If you are a user of iMASCHINE, NI’s on-the-go beat sketchpad for the iPhone and iPod Touch, you can import your iMASCHINE projects to MASCHINE MIKRO to finish your ideas in your home studio.